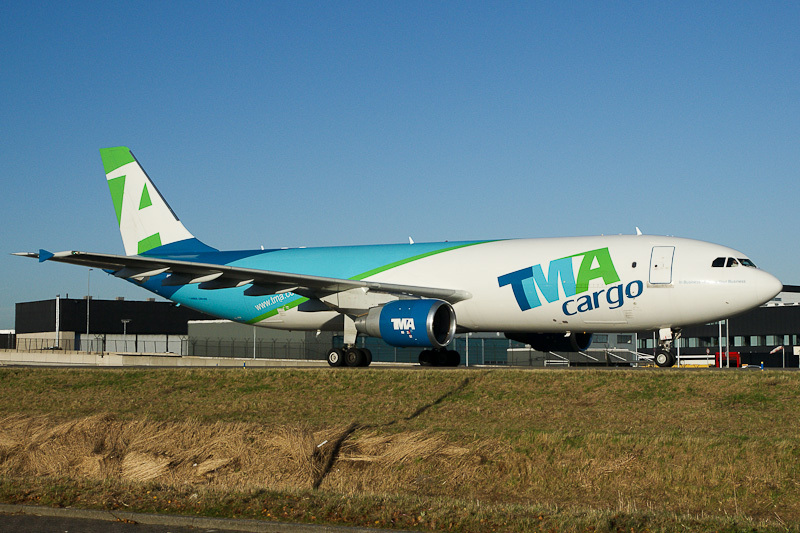 On 22 November 2012, the 2006-built TMA Cargo' Airbus A300F4-622R OD-TMA was seen at Amsterdam Airport Schiphol in the Netherlands. Airbus A300F4-622R c/n 872 flew first with testregistration F-WWAL on 19 July 2006 and was delivered to Galaxy Airlines JA02GX on 29 November 2006. On 28 December 2009, the aircraft was registered N140MN in the USA. On 15 June 2010, registration N140MN was cancelled as exported to Lebanon. In July 2010, the freighter entered service with Trans Merditerraean Airlines as OD-TMA. A300B1 - only two were built: prototype c/n 1 and c/n 2 that flew first as F-WUAC on 5 February 1973. The A300B1 had a flightcrew of two pilots and a flight engeneer and basic accommodation for 300 passengers and with a maximum weight of 132,000 kg. Powered by two General Electric CF6-50A turbofans of 220 kN thrust. A300B2-1A - the first production version, stretched by 2.6 metres and powered by two General Electric CF6-50A engines of 220 kN thrust. It was certificated by the French and German authorities on 15 March 1974 and FAA approval followed on 30 May 1974. A300B2-1C - 137 Metric Ton MTOW; powered by two General Electric CF6-50C engines of between 227 and 236 kN thrust. FAA approval on 19 June 1975. A300B2-202 - 142 Metric Ton MTOW, with Krüger leading edge flaps and different wheels and brakes; powered by two General Electric CF6-50C1 turbofans of 233 kN thrust. A300B2-203 - powered by two General Electric CF6-50C2 turbofans of 233kN thrust. FAA approval on 1 October 1980. A300B2-320 - increased Maximum Landing Weight/Maximum Zero Fuel Weight, powered by two Pratt & Whitney JT9D-59A engines. A300B2K-3C - hot & high version of A300B2 with leading-edge Krüger flaps; powered by two General Electric CF6-50C turbofans. FAA approval on 30 June 1976. A300B4-102 - features a centre fuel tank for increased fuel capacity (47,500 kg). Powered by two General Electric CF6-50C1 turbofans of 233 kN thrust. The first A300B4 ( c/n 9 ) flew first as F-WLGA on 25 December 1974 and was certificated on 26 March 1975. Production of the B2 and B4 totaled 248. A300B4-103 - medium range A300B; powered by two General Electric CF6-50C2 turbofans. FAA approval on 4 October 1979. A300B4-120 - medium range A300B; powered by two Pratt & Whitney JT9D-59A engines. A300B4-203 - extended range A300B; powered by two General Electric CF6-50C2 engines. FAA approval on 2 October 1981. A300B4-220 - extended range A300B; powered by two Pratt & Whitney JT9D-59A turbofans. A300B4-2C - extended range A300B; powered by two General Electric CF6-50C turbofans. FAA approval on 30 June 1976. A300B4-601 - advanced version using A310 technology, design and components like rear fuselage and tail; fuselage cabin stretched by 1.59 metres; has a similar cockpit to the A310, eliminating the need for a flight engineer. Powered by two General Electric CF6-80C2A turbofans; uses the Honeywell 331-250 auxiliary power unit (APU). FAA approval on 28 March 1988. Better known as the baseline modelof the A300-600 series. The FAA issues a single type rating which allows operation of both the A310 and A300-600. A30B4-603 - A300-600 powered by two General Electric CF6-80C2A3 turbofans. FAA approval on 19 September 1988. A300B4-605R - longe range A300-600; powered by two General Electric CF6-80C2A turbofans. A300B4-620 - standard A300-600; powered by two Pratt & Whitney JT9D-7R4H1 turbofans. FAA approval on 19 September 1988. A300B4-622 - standard A300-600; powered by two Pratt & Whitney PW 4158 turbofans. FAA approval on 21 January 2003. A300B4-622R - longe range A300-600; powered by two Pratt & Whitney PW 4158 turbofans. A300C4-605 R variant F - powered by two General Electric CF6-80C2A5 engines. FAA approval on 21 June 2002. The freighter version of the A300-600R. All A300s delivered between November 2002 and 12 July 2007 (last ever A300 delivery) were A300-600RFs. A300F4-203 - freighter version of the A300B4-200. First delivery occurred in 1986, was soon replaced by the more capable A300F4-600. A300F4-605 - freighter version of the A300-600; powered by two General Electric CF6-80C2A5 engines. A300F4-622 R - freighter version of the A300B4-622R; powered by two Pratt & Whitney PW 4158 turbofans. During the long and successful production run, Airbus produced a total of 566 A300s until the A300 ceased production in July 2007. The final version was the A300-600R and is rated for 180-minute ETOPS. The A300 has enjoyed renewed interest in the secondhand market for conversion to freighters. The freighter versions – either new-build A300-600s or converted ex-passenger A300-600s, A300B2s and B4s – account for most of the world freighter fleet after the Boeing 747 freighter.